A portrait of a man seated on a deckchair, identified as Kok (also known as Ajayich) who was an Atuot by birth, but who had lived since childhood with maternal kin in Mandari. As a doctor of powers he practicised locally, divining in the case of possession and advising in matters spiritual. He is wearing a thick ivory arm ornament, which at that time was a prestigious object worn by wealthy people. Note on print reverse ms ink stamp - "Kodacolour Print Made by Kodak limited, London August 1958"
Kok's involvement as a doctor of powers is discussed in several points in Jean Buxton's Religion and Healing in Mandari (Oxford, Clarendon Press 1973), especially pp 87-92. Morton, Chris. 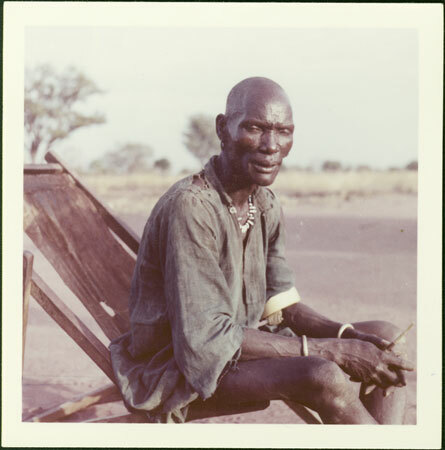 "Mandari doctor of powers" Southern Sudan Project (in development). 03 Jan. 2006. Pitt Rivers Museum. <http://southernsudan.prm.ox.ac.uk/details/1998.97.158.2/>.